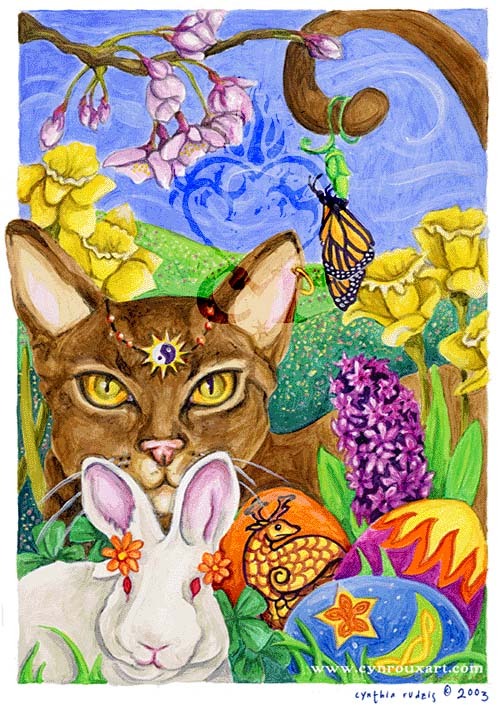 I would like to make Easter Tarot deck... you know, like the Halloween tarot by another great artist, Kipling West. Ostara is the Western aspect of the Great Goddess Astarte. Another aspect of this Goddess is the Jewish Ester, who is celebrated around Ostara, on Purim. Purim is on the 15th of Adar month, which this year was on 14th of March - about a week ago. Ostara is called "The Lady Day" as well, and the Xians call Virgin Mary's Annunciation to Lady Day too. It's 25th of March - about a week after Ostara. The Xians started to celebrate Annunciation in the 5th century of the reckoning, and at that time Ostara was about that date, so it's clear that it's just Ostara in disguise. So - what would the Lady like to eat with you? Ostara is a feast of liberation and life. The land is liberated from snow and new life is born everywhere. From green leaves and grass to yellow ducklings and chiklets and fuzzy little bunnies and lambs. 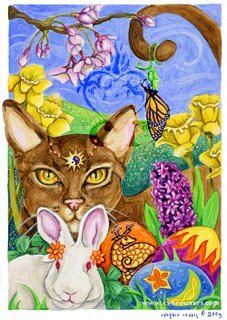 The colors of Ostara are yellow and green - and all the bright, light pastel colors. The classic Ostara food is eggs and sweets. So - nine course meal to celebrate Ostara. This is Easter Bunny by "Tiggerwildcat"
You shake three parts Creme de Cacao and one part vodka with ice and strain that on an old-fashioned glass. The you float one teaspoon chocolate syrup over that, and one teaspoon cherry brandy over that. Chocolaty sweet drink to get you going. You can also make an eggnog. deviled eggs :-) You can also try these baked eggs. Soup with wild nettles - or use spinach if you can't find nettles. You can have these bacon - brown sugar -crackers to go with the soup. Here's a nice recipe "Salmon with Wilted Greens"
Lamb roast - in Greek way - with potatoes and artichokes baked with the lamb. You can also serve Moussaka with the lamb. Place watercress in a large bowl and toss with lemon juice and olive oil. Divide among 6 plates and garnish with toasted nuts and blue cheese. Add salt and pepper if desired, but taste first as watercress tends to be naturally peppery, and the blue cheese may provide all the salt necessary. Then some cheeses and fruits. Dessert: Of course Paschka! It is VERY HEAVY - so just a little bit is very satisfying. 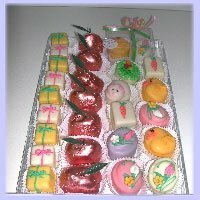 Coffee and maybe some easter candy, if anyone has any room left LOL Maybe you could make some cute petit fours? Don't forget the Scandinavian Easter Witches, if you are doing WorldWide Easter!